It’s making serious discussion of Russian geopolitics and history next to impossible. 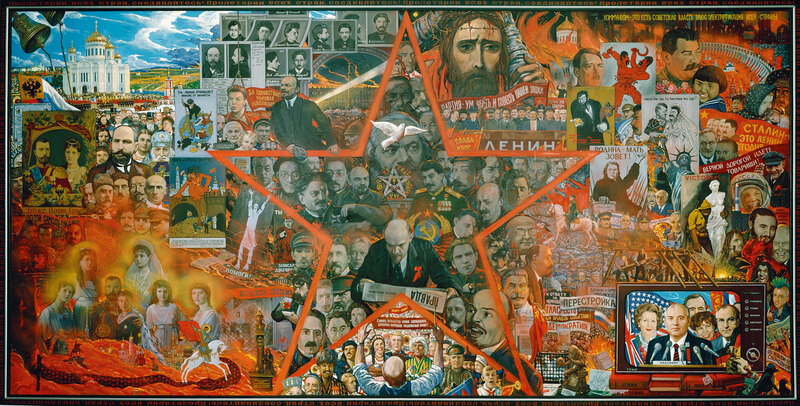 from a larger monumental painting from 1999 by Ilya Glazunov. #1: Here is a very good discussion of this article and its significance on Richard Spencer’s weekly audio roundtable podcast ‘AltRight Politics‘ from January 18, 2018. #2: (Jan 20, 2018) An excellent translation of the article into Russian has been done by volunteers, and it has been published on several large Russian sites, most prominently on Perevodika.ru, where it had about 30,000 views within a few weeks. #3: (March 8, 2018) Important Announcement: Since its appearance, this article has caused an uproar. It has been republished dozens of times in both English and Russian, gotten over 350,000 views, and several articles have been written about it, both criticizing and supporting it, in roughly equal measure. It continues to be read actively. The almost 2000 comments below are extraordinary in their length, and run to hundreds of pages of text, 20 or 30 times the length of the article itself. They are 90% supportive. Since announcing this editorial policy, we has published some 40 articles under our new rubric: ‘The Jewish Question‘, which has again, generated 100s of 1000s of views, and 1000s of comments. We have a large backlog of articles which we will be publishing over the coming months – there is an enormous supply of top quality material, more than we can publish. I have been inundated with letters of encouragement and support, donations, and many submissions. Thanks to all! I’m glad so many people agree with my decision. If you want to help: Please provide your email address in the form below. It is the only reliable way to reach you, because we are being muted on the Google search, Twitter, Facebook, and YouTube. I will be reaching out to supporters in the coming months to raise funds and support to produce more high quality journalism on this issue. If you aren’t intimidated by the bullying, and agree with me that it is time to speak out on this crucial issue, then please sign up! This entry was posted on Thursday, March 22nd, 2018 at 7:26 pm and is filed under Christian Zionism Unmasked, News, Uncategorized. You can follow any responses to this entry through the RSS 2.0 feed. You can leave a response, or trackback from your own site.